The house on the hill has a wicked reputation. Those who dare to darken its door often leave steeped in madness and despair—if they leave at all. 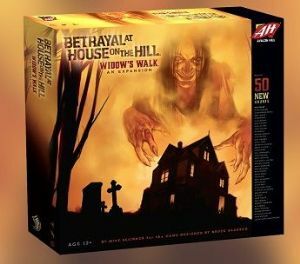 Now the horror reaches new heights with Widow’s Walk—the first-ever expansion for the critically acclaimed board game Betrayal at House on the Hill. The house is expanded with the addition of 20 new rooms, including the roof, a previously unexplored floor. Also in its halls you will find new monsters, items, omens, events, and 50 brand-new haunts, penned by lead developer Mike Selinker’s all-star cast of contributors from the world of gaming and entertainment. In Widow’s Walk, terror and panic are taken to a whole new level.